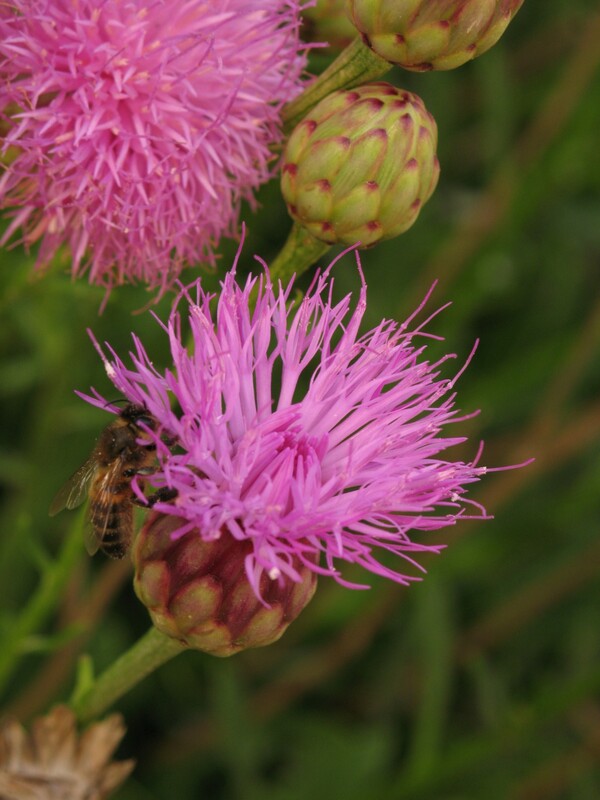 Centaurea spathulata Zerapha non Ten. 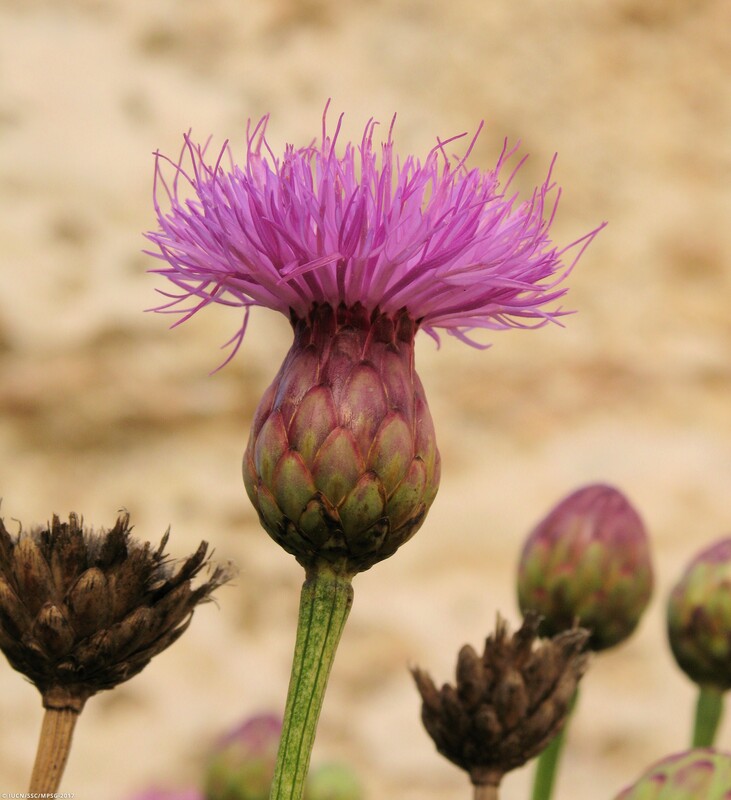 Widnet il-Baħar (Maltese); Maltese rock-centaury, Maltese centaury, Maltese Knapweed (English); Fiordaliso Crassifoglio (Italian). Mifsud S., 2013. Distribution of some rare or endemic chasmophytic and rupestral species growing along the coastal cliffs of the Maltese Islands. Webbia, 68(1): 35-50. Stevens, D. & Lanfranco, E. 2006. Cheirolophus crassifolius. The IUCN Red List of Threatened Species 2006: e.T61621A12524967. http://dx.doi.org/10.2305/IUCN.UK.2006.RLTS.T61621A12524967.en. Susanna A., Garnatje T., García-Jacas N., 1999. Molecular phylogeny of Cheirolophus (Asteraceae: Cardueae-Centaureinae) based on ITS sequences of nuclear ribosomal DNA. Plant Systematics and Evolution, 214:147-160. Cheirolophus crassifolius is a perennial, rupicolous shrub growing along the north-western and southern coastal limestone cliffs (Habitat 13.1: Sea cliffs and Rocky Offshore Islands) of the islands of Malta and Gozo, including Fungus rock (General’s Rock) and Ħagret Sajjetta. It prefers the upper part and the edge of the cliffs but can extend inland as in coastal valleys (e.g. Wied Moqbol, Wied Babu), successive secondary coastal escarpments and scree (e.g. il-Qleigħa at Baħrija, il-Faqqanija and il-Wardija ta’ San Ġorġ at Siġġiewi) or horizontally on cliff plateaus up to 50 m inland. 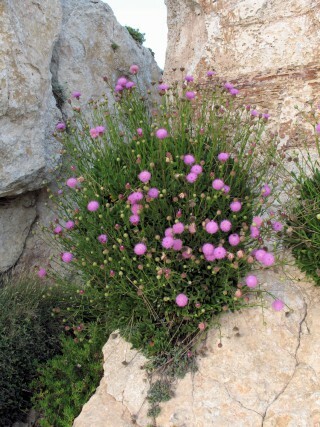 The Maltese rock-centaury is easily recognised by being the only rupicolous shrub which forms dark green foliage and large, purple, thistle-like flowerheads in early summer. The shrubs normally measure 50-100 cm in diameter and form semi-succulent, broadly oblanceolate to spathulate, glabrous leaves crowded at the upper parts of the branches. At the end of May, a flowering stalk is formed from the top of every branch giving rise to a simple or few-branched inflorescence producing terminal, capitate flower heads, which are composed of a few rows of smooth, spineless involucral bracts and numerous, tubular, magenta-purple florets, collectively forming a rather globular flower head about 4 cm wide. Flowers persist through July and set their small seeds, which are equipped with a pappus for seed dispersal by wind, in August. This species represents one of the few really isolated relict species of Malta. It probably survived there and nowhere else during the Holocene glacial events. It is hence considered as a palaeoendemic species. According to recent molecular studies, the species should be placed within Cheirolophus, a genus endemic to the Canary Islands and the western Mediterranean area. The whole population is severely fragmented and is mainly located in three subpopulations found along a considerable stretch (approximately 25 km) of the coastal cliffs from Fomm ir-Riħ (Rabat) to Għar Ħasan (Birżebbuġa), with a gap of almost 3 km from Għar Lapsi (Siġġiewi) to Wied iż-Żurrieq (Żurrieq) mainly due to unsuitable habitat. 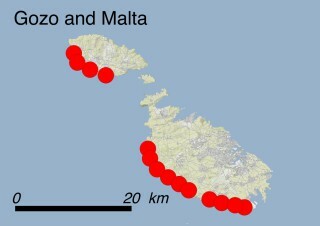 In Gozo, the distribution is less continuous, with three smaller subpopulations at Wardija-Xlendi cliffs (San Lawrenz), Sanap cliffs (Munxar) and Ta’ Ċenċ cliffs (Sannat), each about 1.5 km long. The resulting EOO is 153 km2 and the AOO is 76 km2. Counting individuals on the sheer cliffs is very difficult but 20'000 individuals by inspection is a reasonable estimate. Using these data, the species has been reclassified into Category EN (Endangered) according to IUCN Red List Criteria B1ab(i,ii,iii,iv)+2ab(i,ii,iii,iv). This assessment is based on the observation of a slight decline in both habitat quality and the number of mature individuals and taking into account the severe fragmentation of the whole population. With most of the populations being restricted to inaccessible cliffs, direct threats from anthropogenic activities are minimal. These include localised quarrying fracturing the cliff faces (threat 3.2: Mining and quarrying) and resulting dust pollution (threat 9.5: Air-borne pollutants); dumping of solid waste (threat 9.4: Garbage and solid waste) and land reclamation for farming (threat or bird trapping (threat 2.1.2 Small-holder farming), the latter two affecting only plants on the uppermost cliff border. The introduction of alien species such as Carpobrotus edulis, Opuntia ficus-indica and Agave americana (threat 8.1.2: Invasive non-native/alien species - Named species) may become a potential threat. Major threats for this species are natural, the most important being cliff collapse due to a tremor or earthquake (threat 10.3: Avalanches/Landslides), but such stochastic events are very rare and are unlikely to affect the entire population. Localised natural landslides and rockfall due to sea erosion are predicted to be repopulated by neighbouring plants but one must take into account that the regeneration of this species is observed to be low due to a still unidentified moth which attacks the developing seeds. Legally: Internationally, this species is listed in Annexes II and IV of the 92/43/EEC Directive as a priority species, and in Appendix I (Strictly Protected Flora) of the Bern Convention. The species co-occurs on local cliffs and boulder screes (the so-called rdum) together with several other Maltese endemic and sub-endemic plants. The majority of the areas occupied by this habitat type is protected as part of the European Natura 2000 Network. Nationally, Cheirolophus crassifolius is protected by 92/43 EU Directive Regulations, 2006 (Legal Notice 311 of 2006 as amended). All cliffs on Malta and some cliffs on Gozo are also protected and/or scheduled in terms of environmental and/or spatial planning legislation, either as Special Areas of Conservation, Special Protection Areas, Sites of Scientific Importance and/or Areas of Ecological Importance. The islet known as Ħaġret il-Ġeneral (Fungus Rock), where this species is reported to occur, is a Nature Reserve where access is forbidden, except for valid scientific reasons. In situ: The species is part of the Surveillance and Monitoring Programme of the Environment and Resources Authority, aiming at assessing the conservation status of the species at regular intervals by checking the trends of the distribution range of the populations and the quality of the habitat occupied by the species, as well as ongoing pressures and threats and their intensity. Reports summarising the above mentioned assessments are produced every six years. Management plans for the protected areas where this species occurs have been approved by the Authority responsible for environment protection in Malta; such management plans also include specific actions targeting this species and its habitat. Moreover, activities, plans and projects affecting the area of occupancy of the species within Natura 2000 sites are subject to environmental impact assessment procedures as detailed by 92/43 EU Directive Regulations on behalf of the Environment and Resources Authority (ERA). Ex situ: Cheirolophus crassifolius is considered a flagship species for endemic taxa, especially ever since its designation as the Maltese National Plant in 1971. Since then it has been extensively cultivated, although most of the cultivated stock is derived from the same plant material (since the species is easily propagated by cuttings). It commonly occurs in parks, roundabouts and along the centre-strips of the main roads. Since most of these planted individuals are not able to produce offspring, their effect on IUCN risk assessment should be considered as negligible. Increased awareness on biodiversity, protected and endemic species and control and eradication initiatives against alien species have been of benefit. Since most of the cliffs fall within Natura 2000 sites and the species is legally strictly protected, the most effective conservation measures needed are to monitor these sites and enforce the law according to existing local management plans, especially with regards to quarry expansion, land reclamation and illegal dumping. Further research is encouraged to understand the reason why plants have a low regeneration rate in situ, considering they propagate readily in cultivation.